Provides Accurate splits of the grain samples with an accuracy of +5% on a 1Kg sample. Boerner Divider is available in two different sizes. Body and Inner Parts are of Either Copper or Brass. These cans are provided with full blazed bottom ring, ensured for abrasion resistance and long life. 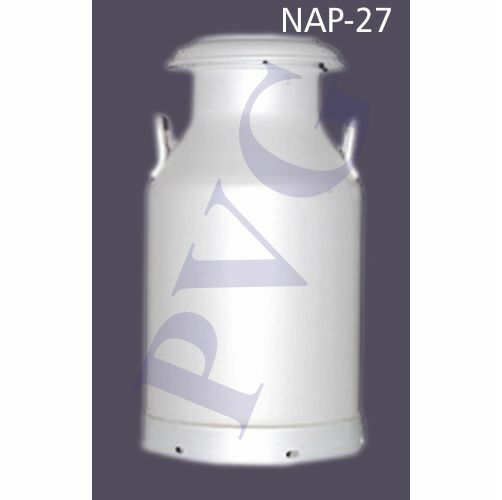 Light in weight and portable, these cans are available in different storage capacities. 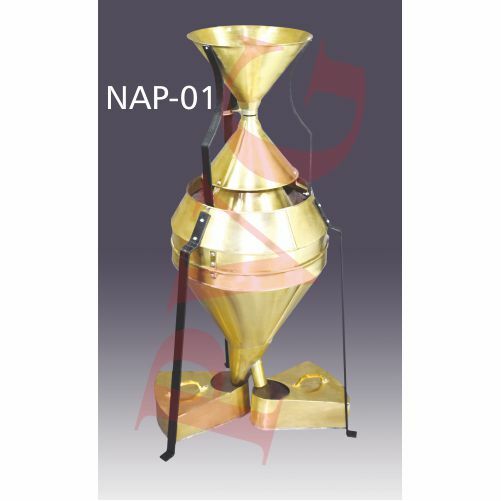 Being counted amongst the leading manufacturers, suppliers and exporters, we offer a myriad of Chaff Cutter. Offered range is manufactured by keeping mind the changing needs and requirements of the clients. 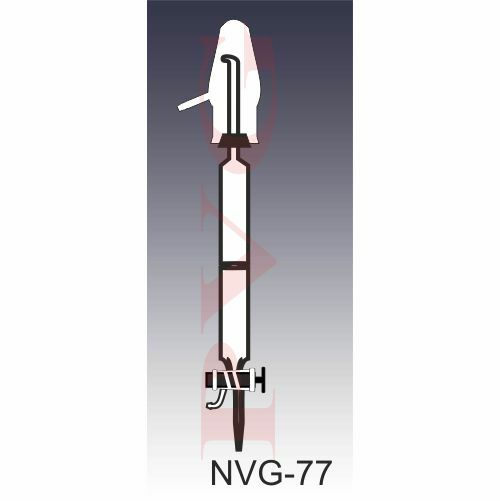 Besides, this range is highly praised as it is offered with salient features like high tensile strength, sturdiness and long functional life that make it popular amongst the clients. Mouth Piece Width 230 mm. Size of Cutter 10 / 14 mm. Size of Fly Wheel 890 mm. 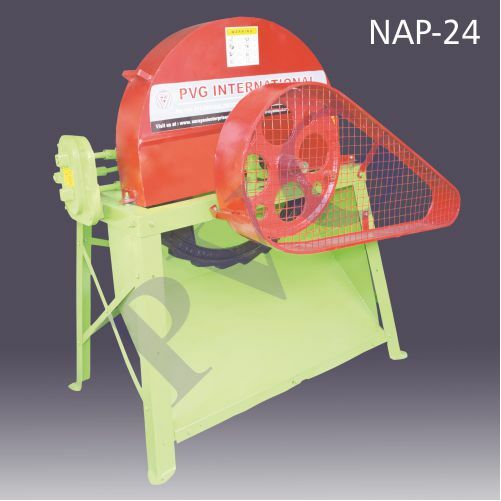 Output (Per Hour)-Dry/Green Fodder500 to 1000 Kg. Size: 30 x 17 x 26 cm approx. • Endotracheal intubation, Automatically monitor if the tracheal Intubation is correct or not through sensor, support ausculation to detect intubation site. • Non-Invasive Blood pressure Measurement- A. Systolic and Diastolic Pressure may be Set Individually In steps of 1MM Hg. For Professional Nursing Training. High Quality manikin provides wide range of exercises possible including both first aid and emergency situations. (I) Head neck and limbs can be moved freely. (ii) The chest skin can be replaced. (v) Oral and nasal intubation nursing. 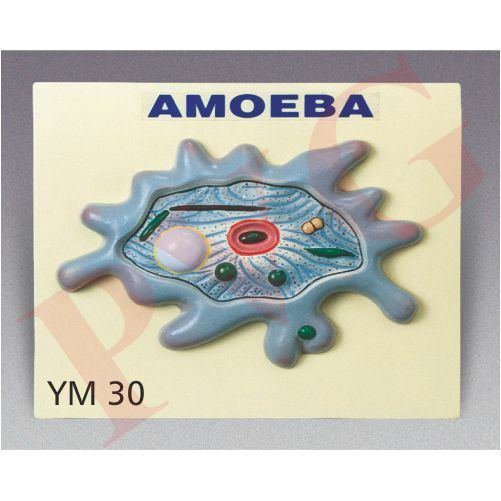 Clearly shows all important features of amoeba. Mounted on a 14 x 12” base, with manual. Cross section mounted on base height approx. 11”, with key. Seasoned wood, one board is adjustable along the support, so desired width can be made for various size of abdomen of various insects up to 13 mm. Central groove tapers to allow versatility in pinning different sized insects and fitted with cork sheet for easy pinning. 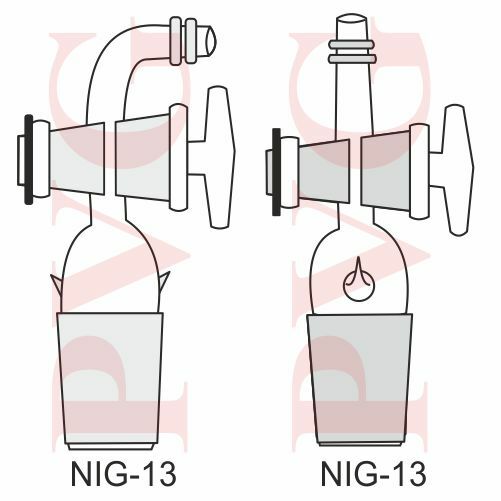 Groove smoothly adjustable in width by means of wing nut or bakelite knob at each end. Size 350 x 110 x 45 mm. 20) Dictyota antheridial thallus v.s. 21) Dictyota oogonial thallus v.s. 45) Sargassum female conceptacle c.s. 46) Sargassum male conceptacle c.s. 47) Sargassum thallus (leaf) c.s. 50) Spirogyra lateral conj. w.m. 55) Volvox oogonial colony w.m. 56) Volvox antheridial colony w.m. 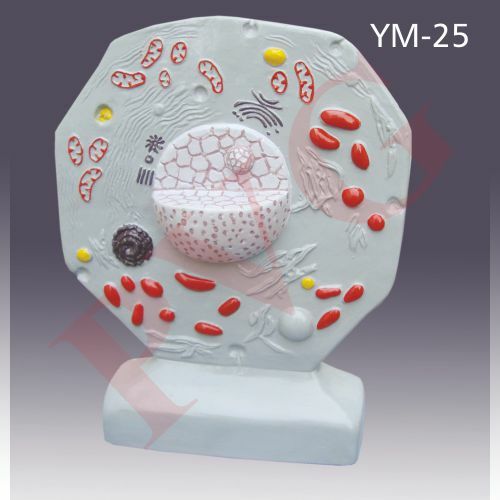 57) Volvox mixed stage colony w.m. 58) Volvox zygote colony w.m. 23) Vaucheria germinating zoospores WM. 12 Concavities 16 mm. Dia., 1.5 mm. Deep, Polished edges, Frosted surface(One side). Cat. No. Size mm. Size mm. Colour Blue for Non Heperinised and Red for Hepernised. Cat. No. Type Material Tested Graduation in ml. Body in ml. Flat bottom with 24/29 standard socket total length 280 mm., O.D. 28 mm. With stopper. Flat bottom with 24/29 standard socket total length 280 mm., O. D. 28 mm. With stopper. Chamber fabricated out of Stainless framework is of mild steel tubulars & with thick epoxy coating (or stainless steel). Re-circulatory type design for safety of the operator and to avoid the inter -mixing of the material / sample to be dispensed. Efficiency : 99.97% (or above) down to 0.3 micron. Supplied complete with: H…E.P.A Fitter, pre Filter, Centri- balanced Centrifugal Air Succession blower Unit, Fluorescent Tube Light, Ultra voilet Tube, Static Pressure Manometer (Acrylic) Safty grills for H.E.P.A and Pre-Filters in heavy duty stainless steel Sheet. (I) 600 x 750 x 1800 mm. (ii) 900 x 750 x 1800 mm. (iii) 1200 x 750 x 1800 mm. 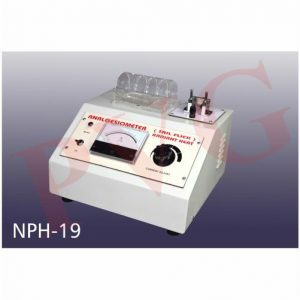 For convenient accurate and quick determination of the refractive indices, mean dispersion of liquids, solids, powder requiring no calculation and skillfulness. Correct refractive index & sugar percentage can be read directly in the field. Heavy casted round base with aluminium body and all other parts of plated brass. Fixed body leaned at 600 angle, Abbe double prisms with the thermostat, compensator, telescope mirror, limb, graduated sector, reading magnifier and radial arm which carries vernier. Abbe’s double prisms leaves a narrow space between the adjoining faces of the prisms. Compensator consists of the amici prisms which serve for rendering the line of achromatic separation. 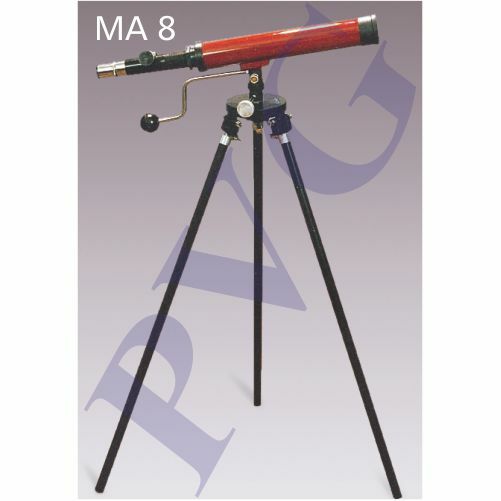 Adjust the eye pieces of both telescopes and reading magnifier, so that well defined images of cross lines and scales is obtained. Open the Abbe’s double prism and put two or three drops of liquid upon the adjoining face of the prism for measuring. When the prisms are closed the liquid spreads over the whole surface of the prisms forming a thin layer. Adjust the mirror to get proper incident light, and also the compensator and radial arm, so that the boundary line of bright and dark is clearly seen in the visual field of telescope. Turn radial arm by means of fine adjustment to bring the line precisely on the cross line and read of scale on the sector. 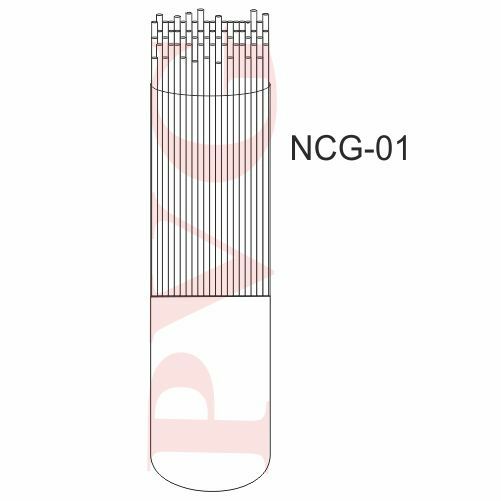 For the dark color substance to be examined as molasses, fructose or jam, the light from the mirror is not sufficient for observation, take off the cover of the circular opening. Then the light proceeds so as to be reflected on the boundary surface and the prism for convenient observation. Abbe double prisms are heated by a double jacket metal casing in which warm water under 70°C circulates. 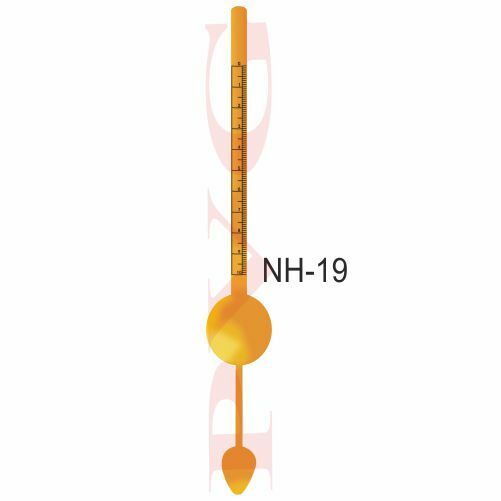 Temperature of water can be adjusted and read by the thermometer fitted at the double prism. 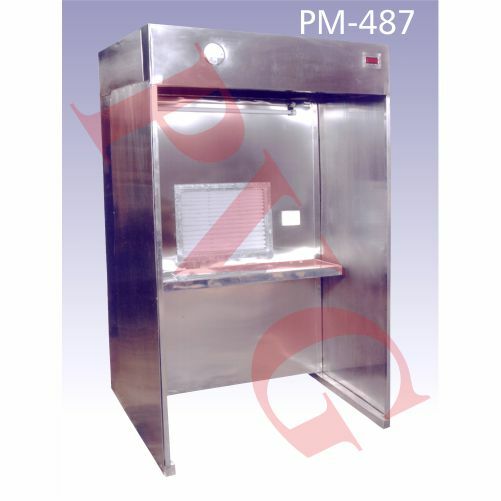 To check the instruments for its accuracy with the aid of the standard plate and liquid that accompanies. Apply a small drop of standard oil on the standard plate and place it with a gentle pressure upon the face of the polished refractometer prism. Critical line should then be achromatized by means of compensator. Repeated readings should be taken, and compare the result of readings with the value of index mentioned on the standard plate. 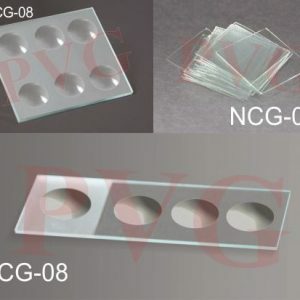 Complete with standard glass test plate, 4 ml. Monobrom Naphthalene (contact liquid), thermometer in a metal jacket, zero aluminium knob, brush, dust cover in a wooden cabinet. For the measurement of refractive index, average dispersion of liquids, solids and for determination of percentage sugar content in agues solutions. 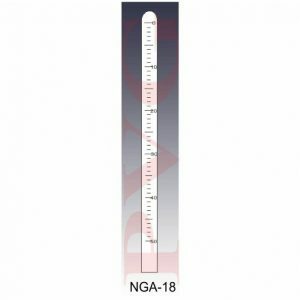 High accuracy with the use of even a few drops of liquid or substance under test the refract metric measurement present a convenient and economical method of testing. 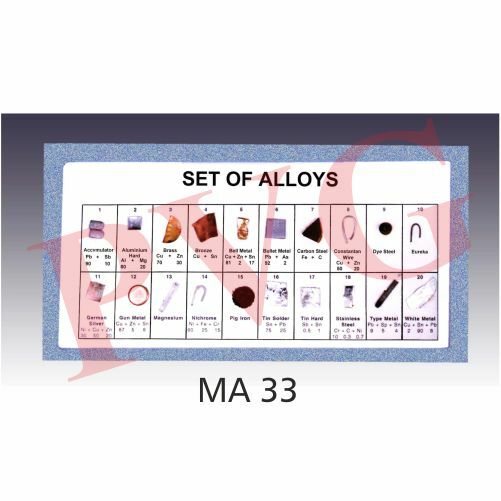 They find their applications wherever the components of mixture show various indexes of refra and control works in chemical and food industry. Refractive Index (nD) Min. Div. 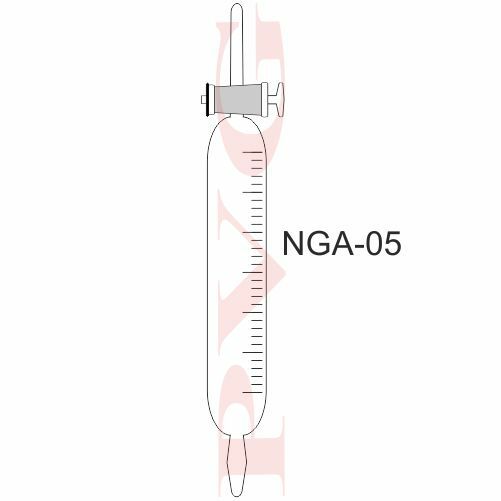 For the measurement of refractive index, average dispersion of liquids, solids and for determination of percentage sugar content in agues solutions. 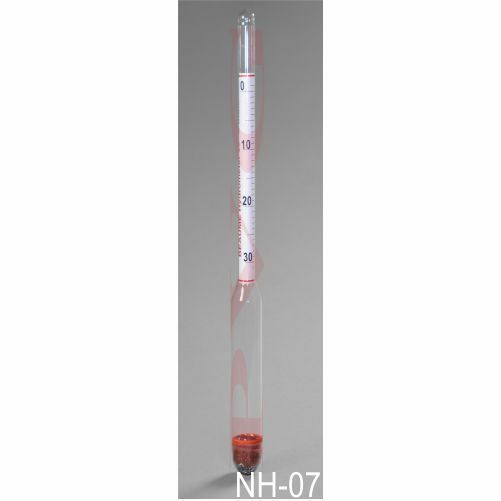 In view of high accuracy achieved with the use of even a few drops of liquid or substance under test the refract metric measurement present a convenient and economical method of testing. They find their applications wherever the components of mixture show various indexes of refraction. 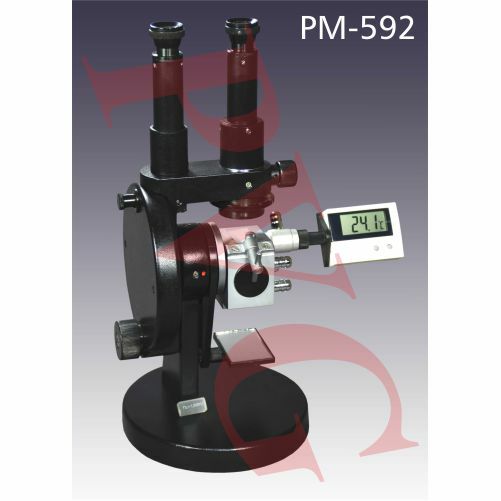 The refract metric measurements are applied to research and control works in chemical and food industry. 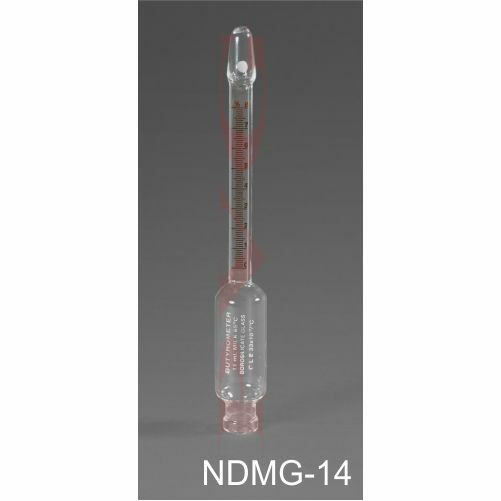 Complete with specific gravity hydrometer range 1.1 to 1.3 glass jar, rubber stopper and rubber bulb. Half black and half white card, 70 mm. square, to provide the background for reading and observation of meniscus, with two cuts to hold burette. For measurement of Microstructures, group discussion, Research & yarn comparison. 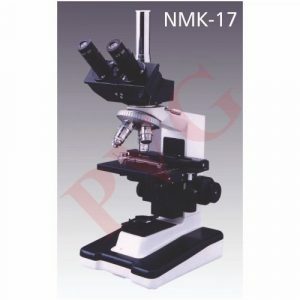 High quality of optics and electronic components used for excellent performance. Images obtained are bright and contrastful with high resolution. Compact dust proof designed body. 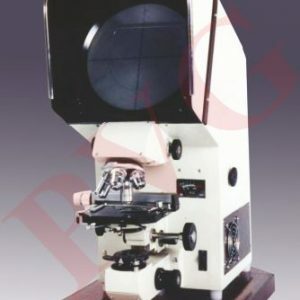 Built in optical glass screen of 195 mm diameter, with high quality Fresnel lens ensures uniform illumination or fully graduated screen of 200 mm diameter with cross lines, in a domerotatable 360º. With a pointer circle controlled by a knob near the screen to point out a particular area on the screen for demonstration. Distortion free single projection Eye piece of 10 x or 15 x.
Quadruple revolving, precentered and click stop nose piece with centered and parfocal achromatic objectives 4 x, 10 x, 20 x and 40 x (spring loaded). Built in graduated mechanical stage having coaxial drive controls with traverse 30 x 40 mm. 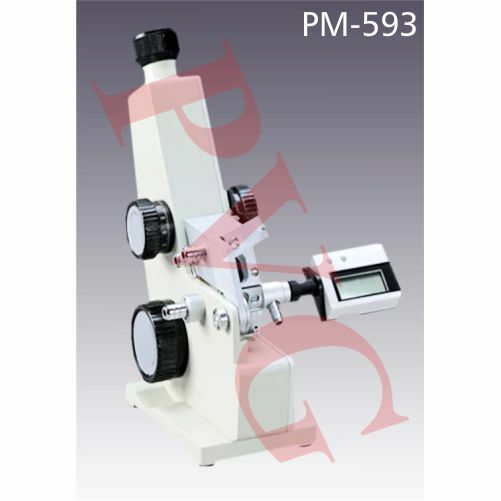 With stage micrometer for exact magnification required for linear and thickness measurement. 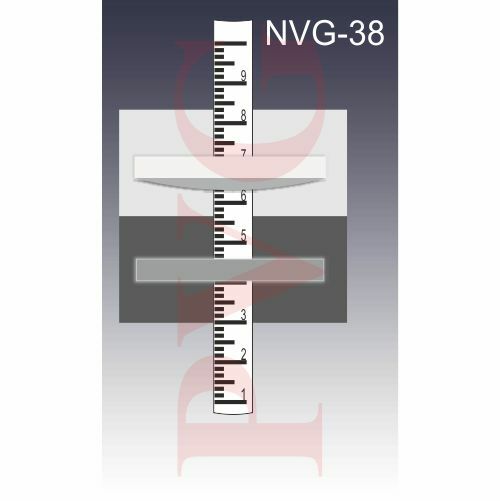 Coarse & fine motion graduated to 0.002 mm of micrometer form. 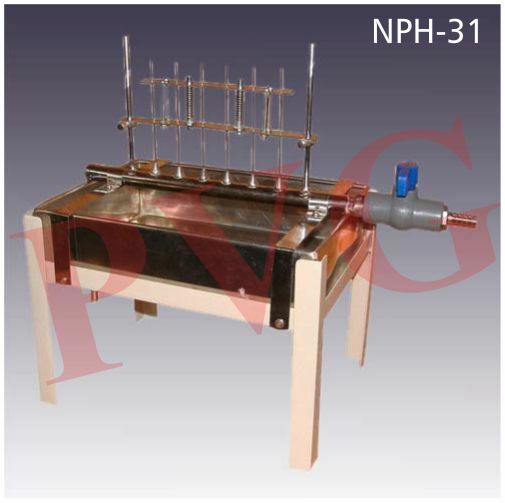 Condenser N.A. 1.25 with iris diaphragm having centering device being controlled by two knobs. 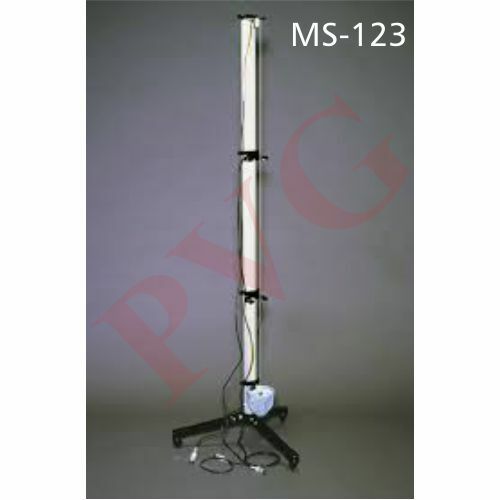 Illumination by 12 V 100 W or 24 V 150 W projection lamp, light controlled by high frequency solid state variable transformer. Complete with three core wire, plug and dust cover. 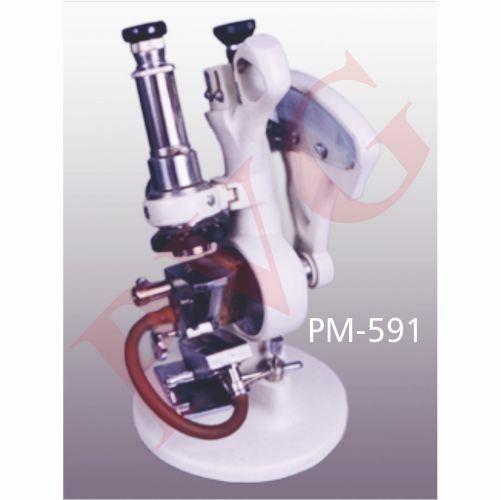 A versatile Microscope for three dimensional view in research and Industrial uses. With Built in illumination, High quality of optics and mechanics. ♣ 3D extra wide field of view. ♣ Coated lens eye piece WF 10 x of 30 mm diameter. ♣ One eye piece tube with diopter adjustments. ♣ Slide in type objectives 2 x and 4 x parfocal . ♣ Long working distance 80 mm and 55 mm. ♣ Fine focus by rack and pinion motion. ♣ Round glass stage with black and white matted plate. ♣ Provision for filter light in the base. ♣ Plywood case with lock and key. 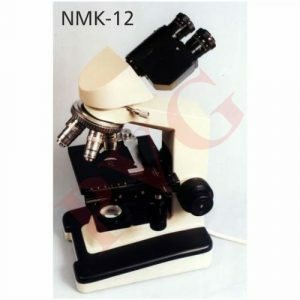 Most advanced instrument with latest in design features. High quality reliable optics for unparalleled performance. ○ Trinocular head rotatable to 360º inclined 45º for maximum viewing comfort. 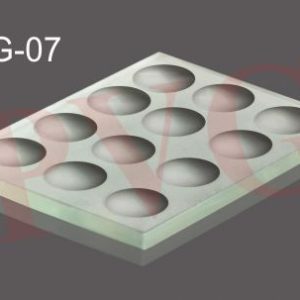 ○ High transmission, multilayer coated optical beam splitter and prism system for crisp images. ○ Trinocular head with convenient finger tip control lever for switching from binocular to phototube viewing. 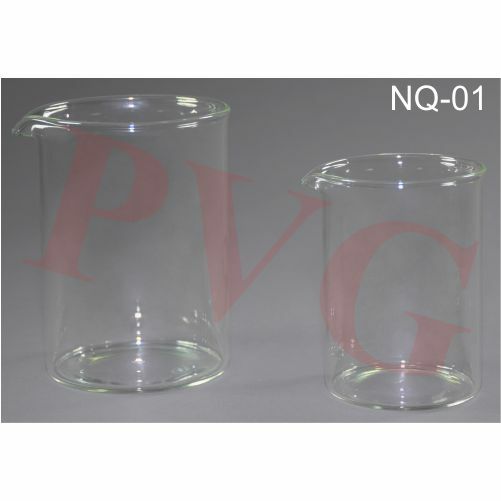 ○ 10 x extra widefield antireflection coated eyepieces. ○ Dual diopter adjustment assures parfocality at any interpupillary distance between 54 and 74 mm. ○ Quadruple revolving nosepiece with DIN achromatic objectives of 4 x, 10 x, 40 x (spring loaded) and 100 x spring loaded with oil immersion. ○ Oversized 140 x 160 mm mechanical stage with ball bearing movement, low position central knobs and removable slide holder. 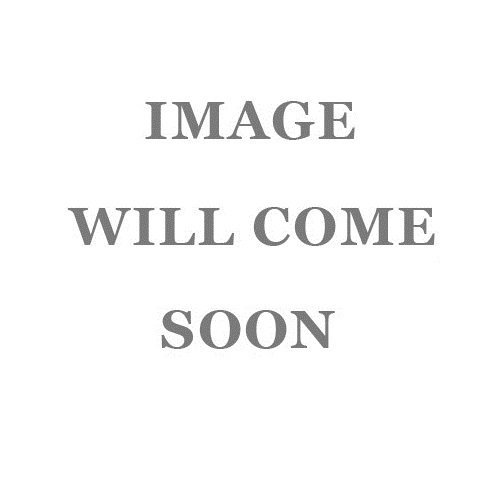 ○ Corrected and central Abbe condenser N.A. 1.3 with iris diaphargm, filter holder with rack & pinion focussing. ○ Coaxial coarse and fine adjustment knobs, ball bearing fine adjustment movement with graduated knobs. Positive preset travel stop. ○ In base variable voltage, 6 V 20 W precentered and prefocusse halogen lamp illumination system provides bright, even illumination at any magnification. 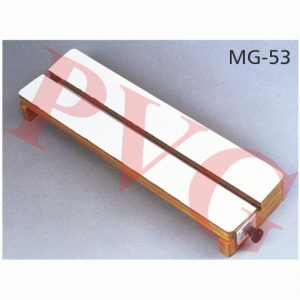 ○ With dust cover cable in thermocole, wooden box. Large extremely stable base and stand. 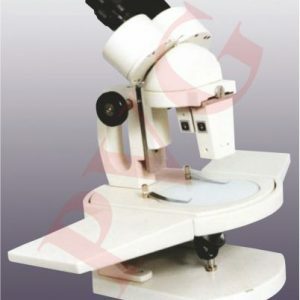 45º inclined sidentop Binocular head rotatable to 360º for ease of viewing and less fatigue. Interpupillary adjustable distance between 50-75 mm. Advanced widefield 10 x eyepieces. Quadruple ball bearing nose piece with top quality DIN achromatic objectives of 4 x, 10 x, 40 x spring loaded and 100 x (spring loaded oil immersion), all objectives with temper resistant sleeves. Oversized, graduated mechanical stage of size 140 x 140 mm with low position coaxial control knobs. Graduated oversized knobs on coaxial control knobs. Graduated oversized knobs on coaxial coarse and fine adjustment. Ball bearing fine adjustment movement and rack & pinion coarse adjustment movement with positive preset travel stop. Abbe condenser with iris diaphragm and filter holder on rack & pinion movement. In base, variable voltage, halogen illumination 12 V 20 W lamp. Complete with three core cable, cleaning cloth & dust cover. 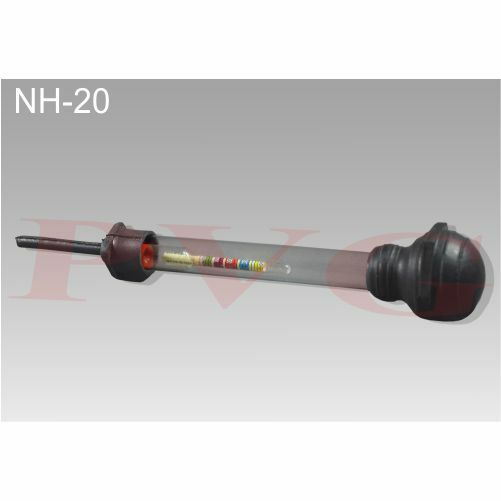 Simple, syringe type, hand driven gives ten ampules per minute, capacity of filling adjustable from 1ml. 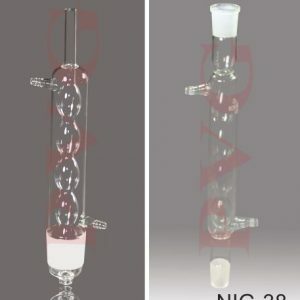 to 10 ml by cam lever arrangements. Automatic intake outflow of fluid. 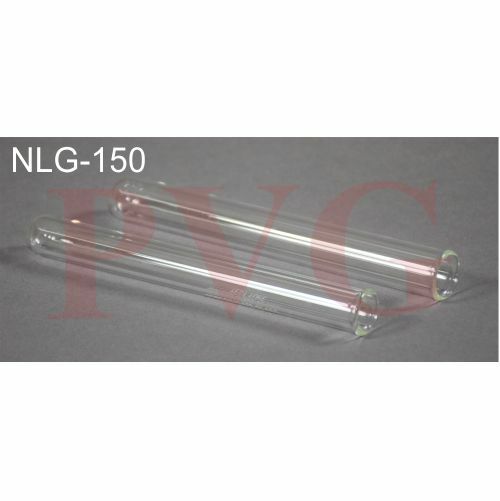 All contract parts are of Borosilicate glass. 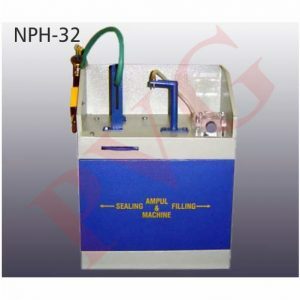 The sealing apparatus consists of glass fusing burner for LPG or Petroleum gas with foot Bellow & Rubber tubing. 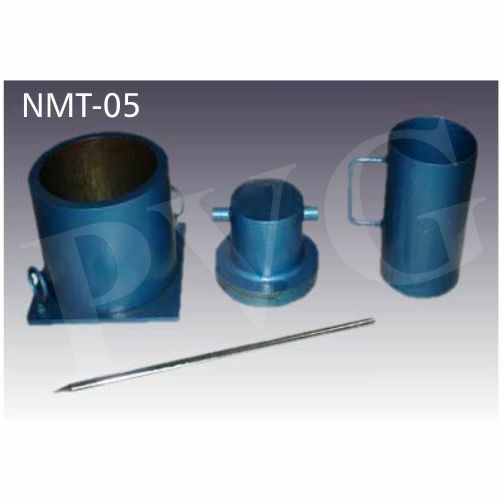 Jet needle type, consists of six Stainless Steel needle jets fixed on a chromeplated brass pipe of 12.5 mm dia with side tap and serrations for fixing rubber with tap water. 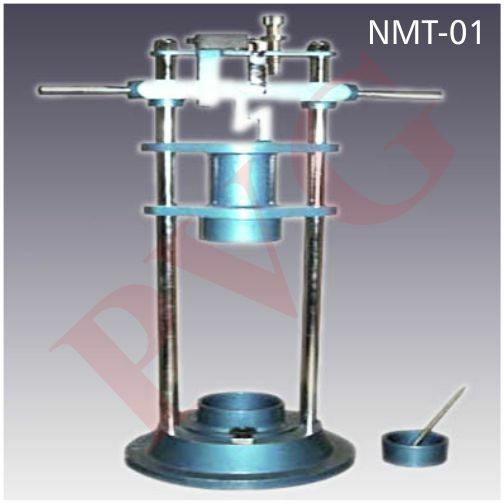 Spring loaded ampoule holding arrangement for various sizes of ampoule. With stainless steel bottom tray on stand. (I) Mark 1 (Radiant Heat or Tail Flick Type): it provides plain stimulus by heated nichrome wire in a rat’s tail to determine analgesic effects of drugs. 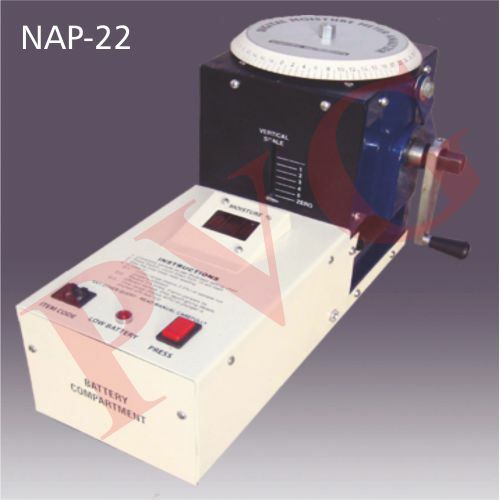 Complete with one spare element to Work on 220 A.C.
(ii) Mark 2 (Contact Heat Type) with temperature indicating Galvanometer provides plain stimulus in Rat’s tail by heated nichrome strip and temperature probe,works on 220V A.C.
(iii) Mark 3: Eddy’s Hot plate consisting of 30 x 30 cm. 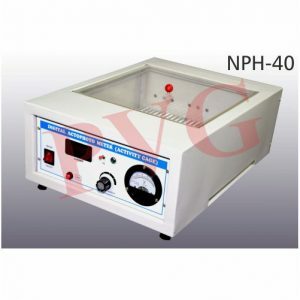 heating surface with perspex enclosure and solid state temperature controller with indicating Galvanometer to set surface temperature between 30° to 80°C. (iv) Same as above, but with Digital temperature controller. This apparatus consist of a heavy casted base plate screwed with 13 mm. 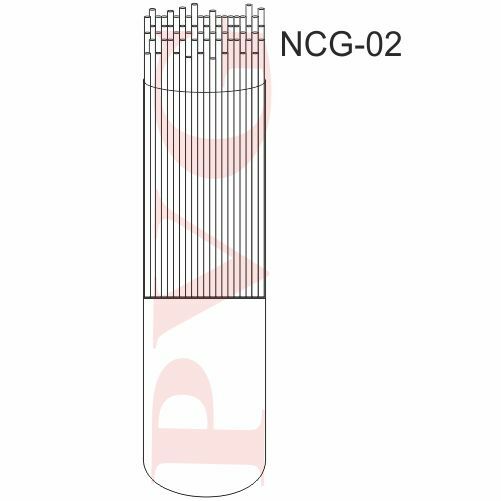 diameter steel rod. Two plastic bases are mounted on the rod to hold two units. 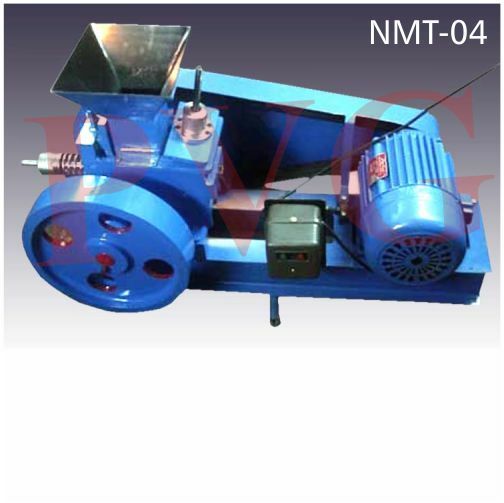 Solenoid unit having a mumetal core which insures immediate release of ball on energizing, gate switch unit comprises a hinged steel plate held against a permanent magnet so that with proper adjustment the plate falls promptly with the impact of falling ball. Connections with color coded 4 mm sockets. A centisecond timer is used, with this apparatus. 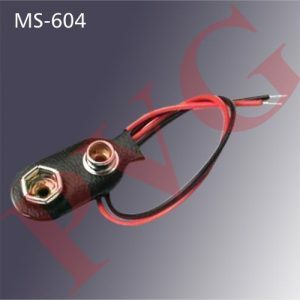 9V Battery connector is used to hold 9V batteries in one side and on other side wires of connector are plugged in power supply unit to supply power to whole circuit. 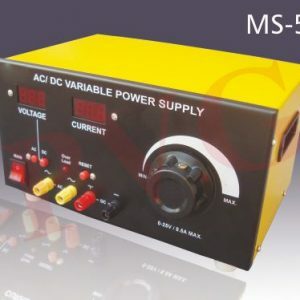 These AC/DC Power Supplies can be builtin electronic overload protecton circuit, High quality band switch etc. at extra cost. 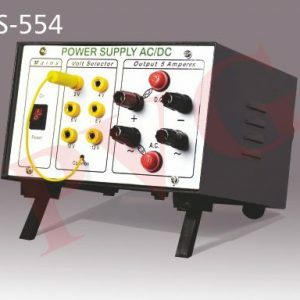 Rugged metal construction, general purpose AC/DC power supply with variable outputs of 0-25 volts current 8.5 amps with digital LED displays for motoring both voltage and current outputs. A low-cost, safe, for applications requiring both AC/DC voltages. 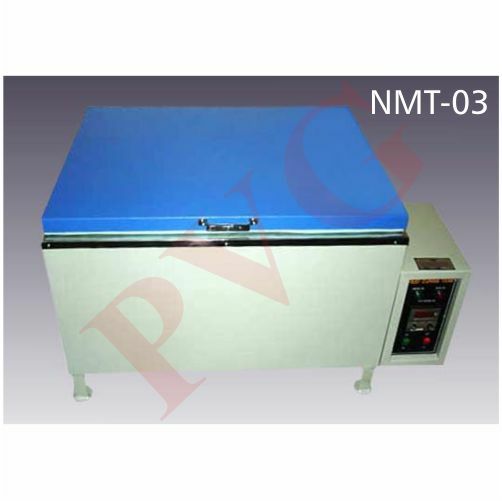 For educational usage and prototyping, covering a wide range of circuit testing applications. This simple AC/DC power source can be used to demonstrate the concept of alternating and non-alternating voltages. Can also be used for simple experiments using lamps, resistors, etc. The unit has been provided with voltmeter and ammeter for AC/DC voltage and current readings. No. 3, 4, 6, 9.
with rubber base and bellows, 216 mm from tip of spray to base.